There is no animal as deeply rooted in our culture as the wolf. Since ancient times, the animal has always been a fearsome adversary for man. Hated, feared, but also admired and respected because of its astuteness and courage. Originally, the wolf was one of the mammals with the largest territories in the world, occupying the better part of the northern hemisphere. However, human persecution has all but eradicated the animal from many areas. In Europe and Asia, its territory has been reduced with 25%, although the main populations can be found in the Eastern European countries and on the Iberian Peninsula. In the 19th and 20th centuries, the wolf was intensely persecuted in Spain, to the point of disappearing entirely in most of the country. Around 1970, the last surviving populations were forced to live in the most inaccessible places in the northwest of Spain, near the Portuguese border and the Sierra Morena. Photo taken with trap camera during the estimation of the pack’s size, as part of the Iberian wolf population census, carried out by Lobisome Naturaleza in September, 2013. The wolf moves in an area almost 100,000 km² wide. In 2005, it was estimated that the population consisted of around 254 groups that were related for certain, and 68 that were probably related. Almost 90% of the population was distributed over the region of Castile and León. The most populated areas are in the northwest of the province of Zamora, with an estimated number of five to seven specimens per 100 km² (practically per territory), although it would be safer to say the average size of each group would be of four specimens. Wolves are especially versatile, as their greatest asset is the lack of any great specialisations. The Iberian wolf is a good example, given the largely varied environment it lives in. All it needs is protection from man, enough food at its disposal (wild ungulates and domestic cattle in the form of carrion), dense vegetation and a low density of human population. But most of all we have to stress that the more humans tolerate them, the fewer ecological requirements wolves need to survive. In Spain and other densely populated countries, wolves tend to be active during the night, sleeping almost all day in some densely populated areas in order to avoid human contact. They can cover up to 48 km during their nocturnal rambles. Their bodies, accustomed to doing long distances, and their social structure, give them qualities that make them super predators par excellence. Wolves are capable of hunting prey that is both larger and faster than them, using tactics like persecution and ambushing. In the wolf’s annual cycle we can see two different periods: the first is the breeding season, between May and October, the second is the rest of the year. Wolves live in hierarchic packs, generally consisting of specimens of the same family. The members of the only reproducing couple are the dominant ones, and the young ones born the year before often help with the breeding. The period of heat usually occurs between late January and early April, while the gestation lasts around 63 days. The litter’s average size is usually of five cubs. In summer and early autumn, all members of the pack can be spotted together. The Iberian wolf (Canis lupus signatus) is a subspecies endemic to the Iberian Penisula. The species was labelled “Almost Threatened” by the IUCN, it is a “Species of Community Interest”, and it figures in the “Habitats Directive 1992/43/CEE”. According to the Spanish Strategy for the Conservation of the Wolf, it is necessary to promote the figure of the wolf as an environmental and cultural value, which amply compensates its limited negative effects on stockbreeding. 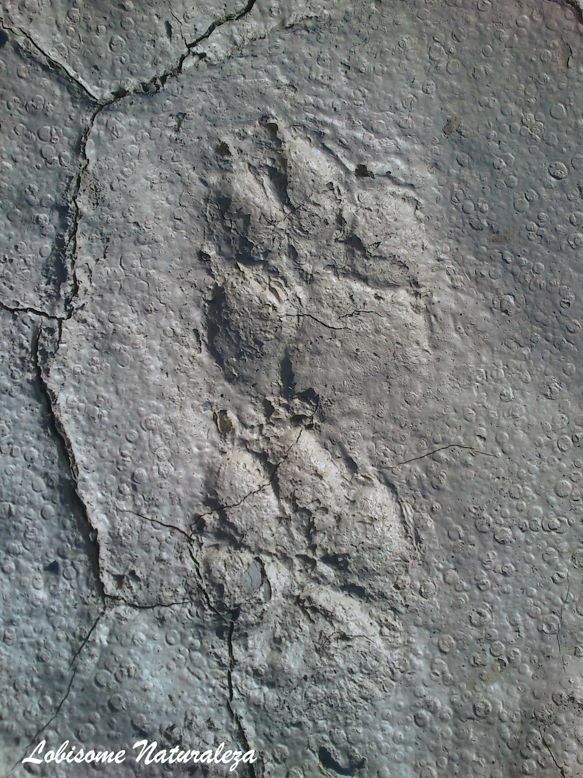 Download a PDF with our free mini-guide (in Spanish) about the Iberian wolf: tracks and traces of the wolf and its prey, so that you won’t miss anything in the field. Please use the provided information responsibly.